Mock duck, vegan ham, vegan crispy chicken? I’ve always been a bit sniffy about the concept of “pretend meat”, even if it is a venerable Asian tradition. We love, eat and cook quite a range of non-meat food, especially Indian at home. But I’ve long held that if we are to do without meat, then let’s not pretend … so to speak. I now suspect my ambivalence about mock meat has had quite a lot to do with the fact the Chinese food is not way up high on our list of favoured cuisines – and it’s with Chinese cooking that I most associate these kind of products. 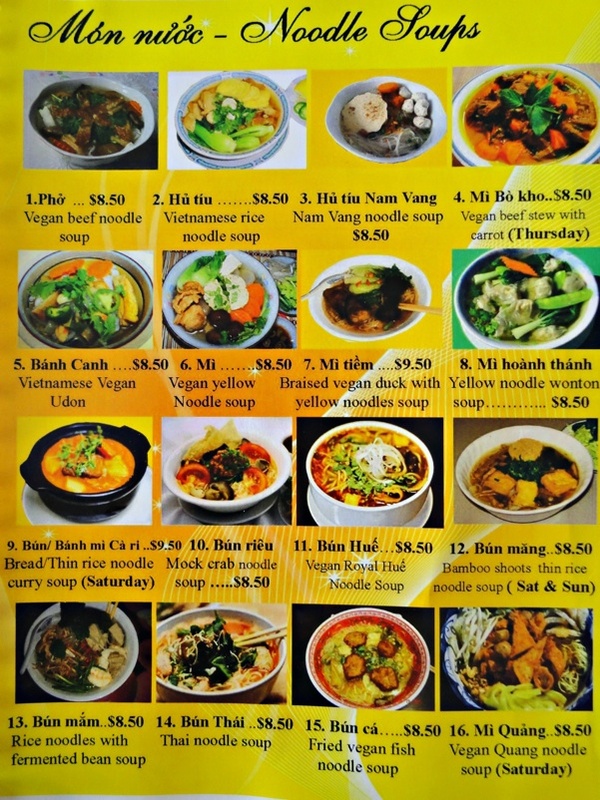 Because I find that when they are matched with Vietnamese food, my whole outlook is transformed. 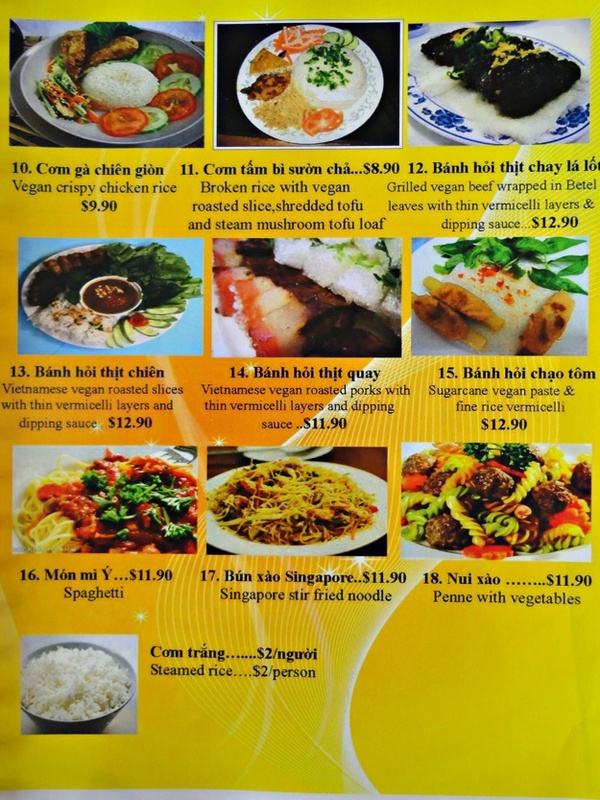 I am intrigued and tickled pink as I take in the menu at Charitable Vegetarian Restaurant. 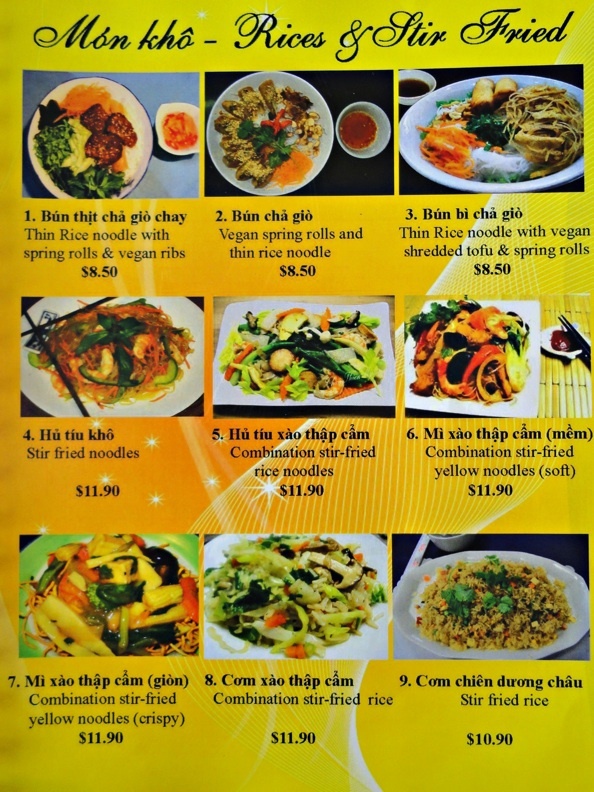 Pho, rice paper rolls, vermicelli, “beef” stew, crispy “chicken rice – the menu is packed with Vietnamese staples done in ways that are completely free of meat and seafood. 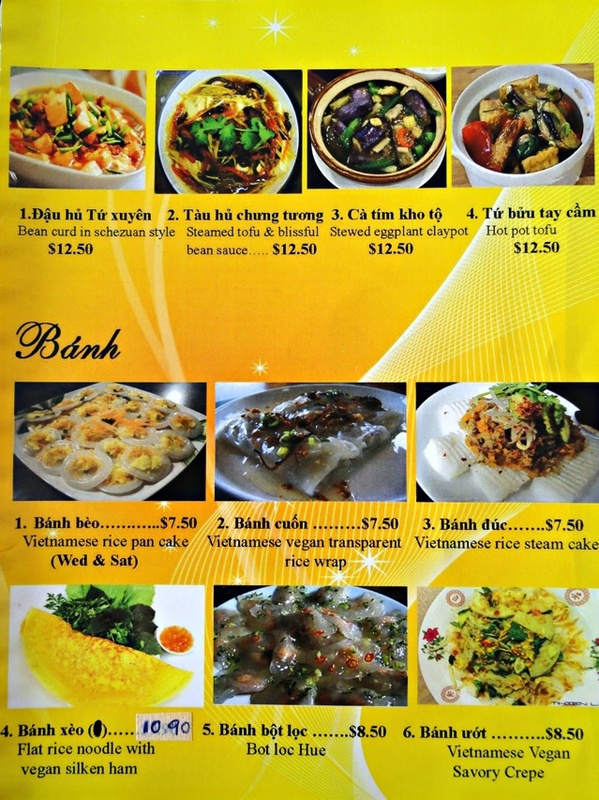 But whatever broadening of my mind that is transpiring here, I play it safe by ordering a dish that looks like it’ll be a very close cousin of its non-vegetarian version – bun bi cha gio (8.50). Instead of shredded pork, there’s shredded tofu. The spring rolls are much more genteel and smooth of interior than I expect, with none of the crunch and texture of nuts or mushrooms I had foreseen. 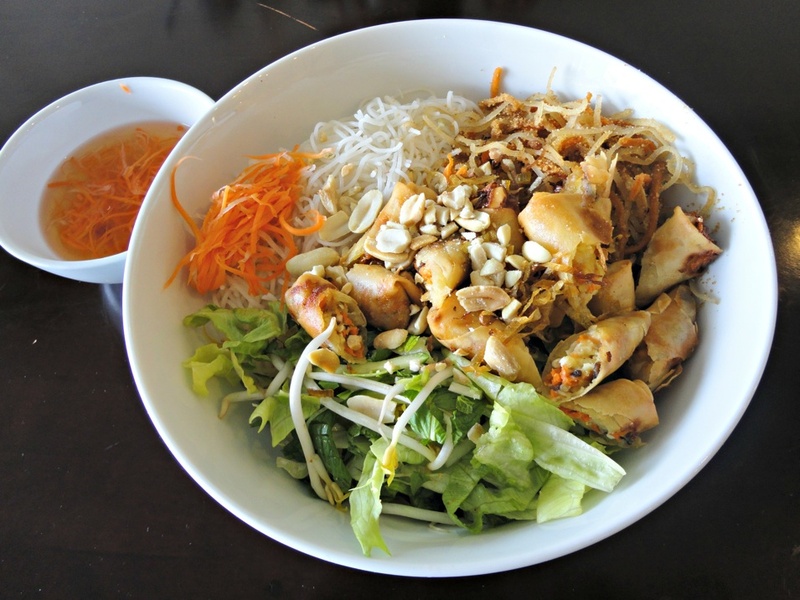 There’s lettuce, grated carrot, mint, peanuts and bean sprouts, of course, along with the vermicelli, and the accompanying chilli sauce adds a good seasoning kick. It doesn’t quite have the same flavour kick of the various meaty versions, but a degree of subtlety is only to be expected. But it’s a nice change, even if a certain mealiness becomes more apparent as I near the end. It’s big serve and I don’t quite leave my bowl clean. It’s not until later that realise there’s been no onion or vinegary tang. Perhaps the spiritual and philosophical outlook of the place prevents it, though I notice there are menu items that include garlic. 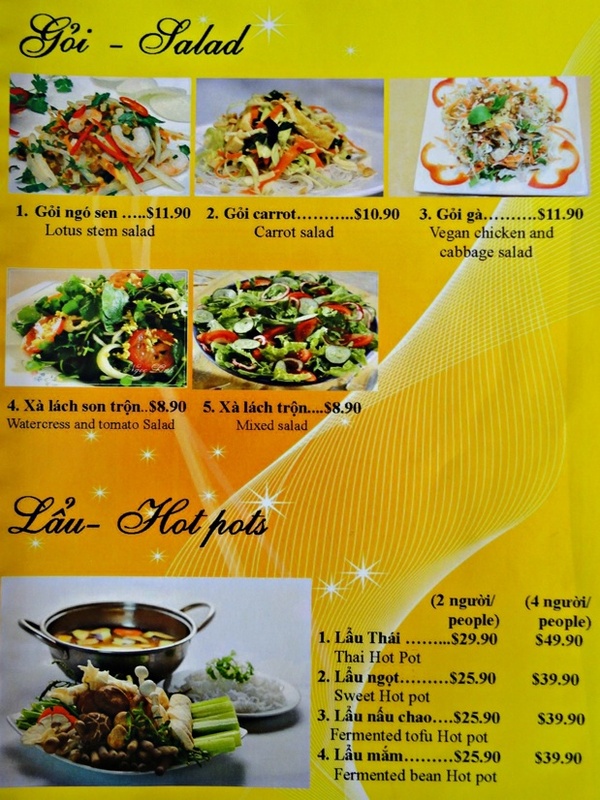 I’m very interested in this place in general and what’s in those spring rolls in particular. 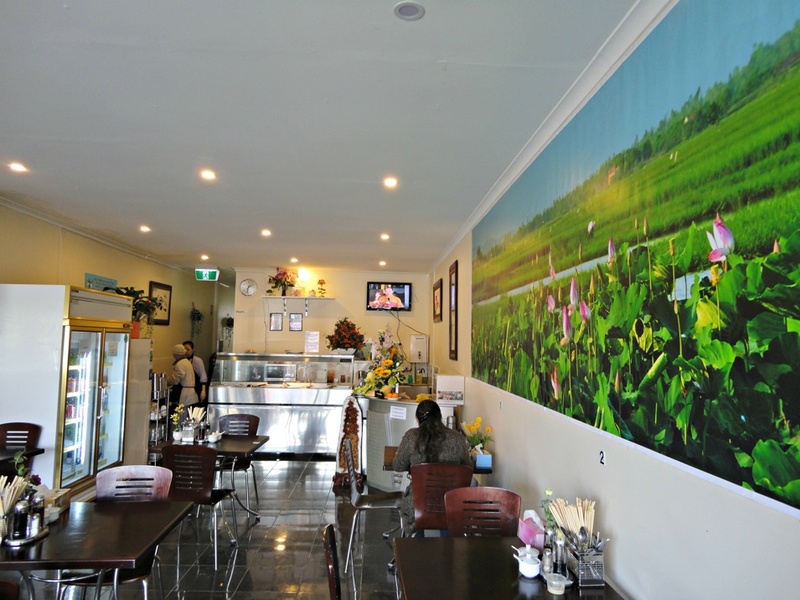 But I find the robed and smiling staff are no more adept at English than I am at Vietnamese. So we’re at a stalemate until I gently accost a customer seeking a takeaway lunch, and discover that, yes, she speaks English and will be only too happy to help out. 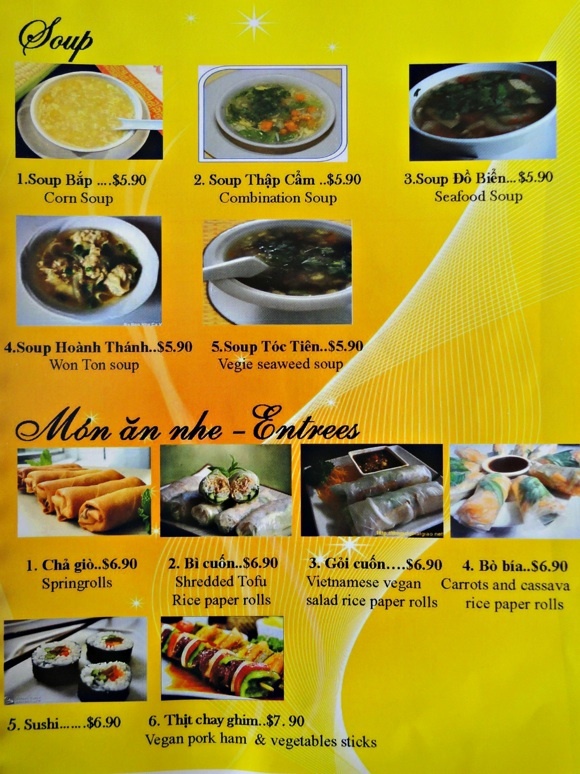 The spring rolls contain, I am told, nothing more than vegetables and tofu. The restaurant has been open since late July. It’s a Buddhist establishment, basically – as the name indicates – being run as a charity, with all the cooking done by monks and nuns. My lovely translator, Mo, tells me she herself is Buddhist, as are her parents. She says that while younger generations of Vietnamese are less likely to embrace such spiritual or food traditions, among older generations she believes adherence may be even higher than 20 per cent. 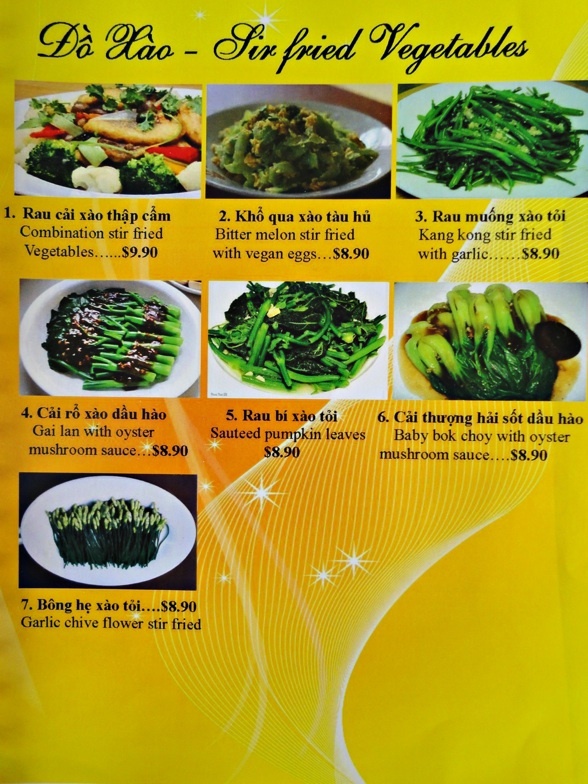 I’m excited about the idea of exploring the menu further – there’s Singapore fried noodles, some good-looking salads, steamboats, straightahead vegetable dishes such as sauteed pumpkin leaves and a whole lot more (see full menu below). If anyone tries it, please let us know your hits and misses! There seems every chance Charitable Vegetarian Restaurant will become a magnet for vegetarians, not only from the western suburbs but from all over Melbourne. Thanks, Mo, for being so gracious about being asked to provide translation aid! A is for Alfrieda Street. And awesome.